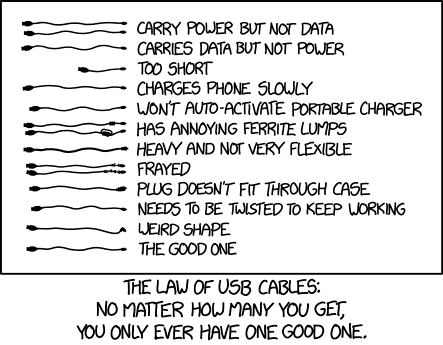 If you’ve ever decided to allow a digital computing device into your life in any way, that means accepting cables into your life. Power cables, video cables, keyboard cables, printer cables, A/V cables… the list goes on. As the result of a recent move I’ve been forced to take the time to address the obvious: I have far more spare cables than any family of 12 would ever use, and I’m a family of one most of the time. That’s 74 cables that were sitting around in a box. This does not include the cables I have in use today, or have in my man-bag ready to be in use on the road. I also didn’t count the really esoteric cables, like the ones you could use to connect Cthulhu to an Atari 800. We won’t speak of those. So. I now have a box of cables going to Free Geek. I’m stripped my spares collection down to no more than two spare cables of each kind. Yeah, it’s true that the future is wireless, but until it gets here, I’m keeping some cables around.